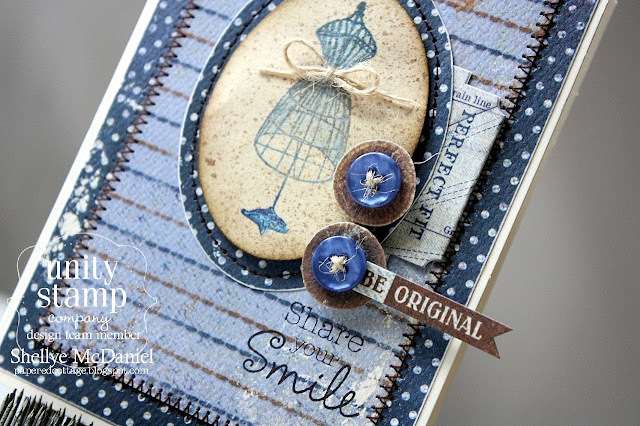 especially paired up with the gorgeous "Share Your Smile"
Itty Bitty Authentique/Unity co-branded stamp! Kaleidacolor by Imagine Craft and colored in lightly with a blue watercolor. All of the patterned papers and stickers are from the Original Collection. I've had the pleasure of hosting this month's Unity Challenge: Pumpkins. Here are two samples that I made for it! I invite you to come on over and play along with us! oh i LOVE that dress form stamp!! So classy. And the additional touches to the card and stitching.. nice!! Oh, I love all your projects but that dress form one is gorgeous! LOVE the blues you chose, and the button details! All just gorgeous! Love the Authentique papers, and your fancy pumpkins!! Great cards, especially love the first ine with the dress form. Gorgeous! Great cards! Love that dress form! 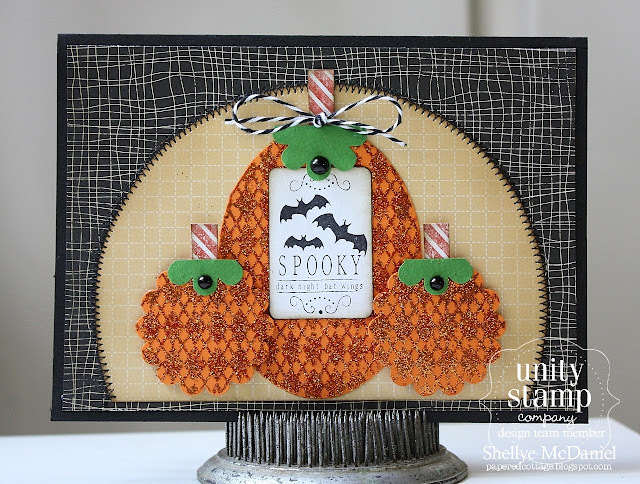 I love the blues in your first card and the pumpkin ones are adorable! You amaze me over and over again with your super cute cards!! I love the dress form card...it's framed perfectly. Gorgeous cards! I love the first card and how you embossed the background stamp to make those adorable pumpkins on the second card! More stunning cards..have i told you i love them? Gorgeous and the papers are beautiful!! Gorgeous designs. I adore these stamps! beautiful cards - especially love all the shades of blue on the first one. Oh wow! These are gorgeous! Love the stitching and the bow around the waist of the first and the great sparkle on the second. So pretty! Both cards are stunning!! Wow! You gals are oh soooooooooo talented! that dress stamp is so classy. All your cards are so eye catching. And the use of Unity makes them even more prettier. wow!!! I love all your cards, but the first just blew my mind!! So elegant, so beautiful!! Fabulous!!! and the dress form stamp looks just perfect!! I LOVE the dress card. It is in one of my favourite colour schemes. Pumpkin is also cute. All your cards a great but WOW those glittery pumpkins are so perfect. I love both cards and the bag! AWESOME! beautiful projects...love the gliter pumpkins! All your projects are beautiful! I love the Authentique stamp. Love your dress form card and the colours are great too! Wonderful cards! I really love the pumpkin one!!! Fabulous cards--I like the dress from with the Original paper. Love all your cards!! Just stunning!! Lovely projects! LOVE the dress form one- the blues and browns are gorgeous together! Wow just love your cards...the first one is so elegant, the 2nd has great handmade pumpkin images and love the clean lines of the last. Love the Share your Smile card-Authentique Original collection is awesome! The sparkly pumpkin card is really cute!